When it is time to drywall your property, there are endless steps, instructions, guidelines, and materials that must be implemented with perfection to achieve a level-5 drywall install. One of the most important materials that will make a big difference in your end result is your spackle. Continue reading to learn more about spackle, and some important tips that go along with its preparation and application. Spackle is a paste-like made from fine aggregates of limestone, dolomite, water, mica, perlite, polymers and pyroohvllite. It is also referred to as “drywall mud” or “joint compound”, and come in two basic categories. These categories are known as “Quick-setting” drywall mud and “pre-mixed drywall mud.” The type of drywall spackle you use will depend on the type of job you have to do. Quick-setting drywall mud is not the traditional go-to spackle for moderate to large-scale drywall install jobs. Instead, it is perfect for small patch jobs that require a quick turn-around time since it does not required you to wait a full 24 hours before applying a second or third coat. When you have small holes or cracks that need repaired, a quick-setting product is a great choice. However, it is not usually used as a finishing coat because it is more difficult to sand compared to a lighter-weight, all-purpose spackle product. In fact, when using hot mud to patch up a drywall hole, it is encouraged to finish the surface with a light-weight, all-purpose mud. A popular tip from the pros is to always use hot drywall mud if you are also using mesh tape because mesh tape does not provide a bond that is strong enough. Another important tip is to make sure the hot mud is fully dry before applying additional coats. Just because you use a 45-minute hot mud product does not mean it is done drying in 45 minutes. It could take several more hours. Drywall spackle is dry when it turns completely white. Pre-mixed mud is considered to be the traditional spackle for drywall projects. It comes ready to use as a mud; all you have to do is add a little water to get the proper consistency. For instance, bedding tape will required a thinner consistency. Similarly, you will need a thin consistency of mud when using automatic taping tools so that it allows smooth flow through the drywall mud pump and tools. But you must be careful, because if the mud gets too thin, it will not spread properly and it will shrink back too much, leading to cracking, warping, and similar surface blemishes. It is basically a long learning curve when it comes to knowing the proper mud consistencies to use. It simply takes experience, and trial and error. Although there are several types of joint compounds on the shelf to choose from, there are three common types that drywall professionals tend to use. These include all-purpose, light-weight all-purpose, and topping. All-purpose joint compounds tend to have more adhesive agents in them, making them suitable for most drywall applications, especially when bedding seams. Light-weight all-purpose drywall muds are recommended for the first and second coat of seams and corner beads. They contain less adhesive agents, so it is not always a great choice for taping seams. Topping drywall mud is not used as often as the former types of spackle, but it comes in handy for texture applications, as well as, top coats for seams and corner beads. It is too light weight to use for taping joints. When it comes to using spackle for basic drywall projects, all you need is a mud tray, an inside corner tool, and an assortment of spackle knives ranging from 4 to 12-inch blade widths. If you are working with curved archways, you may also need an outside corner tool. Just be sure to keep your tools clean after every use. Use a small scrub brush and clean water to gently remove mud residues and dust. 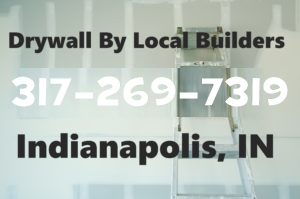 Call Drywall by Local Builders at 317-269-7319 to request a free estimate for drywall installation in Indianapolis, Indiana. We offer a wide range of drywall services, for both residential and commercial properties, including new construction homes, remodels, repairs, metal stud framing, ceiling grids, and more. Call 317-269-7319 and speak with our Indianapolis drywall contractors about your home remodeling needs, today. This entry was posted in Drywall Advice and tagged Drywall Mud applications, Drywall Mud types, Drywall Spackle Tools, Indianapolis Drywall Contractors, Quick Setting Mud, Topping joint compound. Bookmark the permalink.